Blocks are components that represent a subset of the groups found within Particular. For example, the size of particles, the color of the particles, and the Particle Type are all components of Particular represented by Blocks in the Designer. Here we will take a look at starting out fresh from the Designer's default blocks in the Effects Chain and learn how to create a new effect within the Designer. To begin, access the Blocks pane in the upper right corner of the Designer. Move your cursor over the word Blocks (or the area immediately to its left). This will open the Blocks pane in Unlocked mode. This means that if your cursor goes back to the left side of the Designer interface, the Blocks area will automatically close. You can click on the arrow beside the word Blocks to put it in Locked mode so it stays open. Click the arrow again to put it back into Unlocked mode. 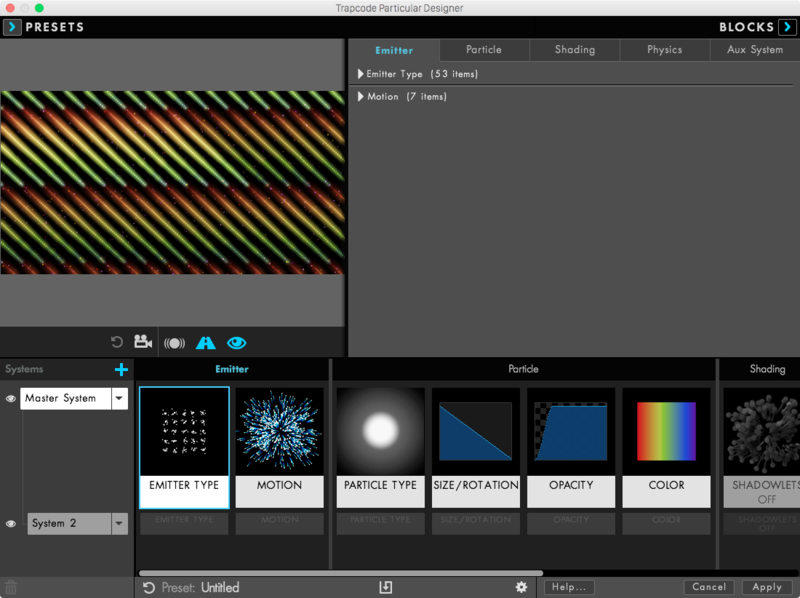 The pane contains five sections of preset Blocks that correspond to the groups and sections of the main Form user interface in After Effects. Note that these also apply for each system in a Multiple System setup. Emitter: The Emitter Blocks control where particles are born and given their initial velocity and direction. Learn more about the Emitter Group in the AE Interface. Particle: The Particle Block section allows you to choose the particle type or select a pre-rendered ‘.mov’ Sprite from the Sprite library. This section also contains parameters like Size/Rotation, Opacity, and Color. 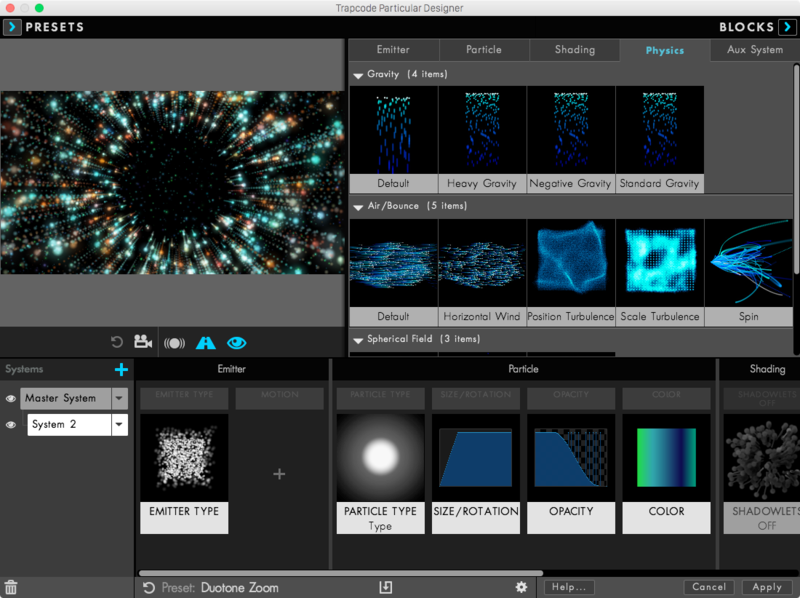 More on the Particle Group in the AE UI. Shading: The Shading Blocks allows you to apply Shadowlet Blocks which will interact with any lights that you have setup inside your AE comp but may not be visible within the Preview Pane window in the Designer. Read more about this category on the Shading Group page The Shadowlets page explains more about the Shadowlet Blocks in the Designer. Physics: The Physics Blocks control how particles move once emitted. 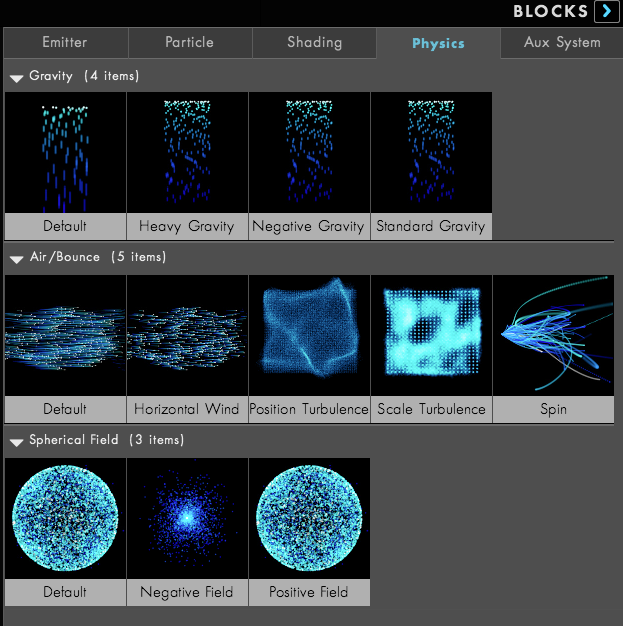 You can set properties such as Gravity, Turbulence and Air/Wind effects on the particles. The Physics page explains more about how the features in the Physics section work. Note that Bounce Physics are not available inside of the Designer. Consult the Special Handling section in the page in the Particular Designer documentation about the Effects Chain for more information. Aux System: The Aux section Blocks create an auxiliary particle system that uses each particle in the original effect as an emitter. This is useful in creating the look of trails moving away from the main particle and can create very complex results. Read more about the Aux System here. The Emitter Blocks are divided into 2 different categories. You may have one from each category represented in the Effects Chain. 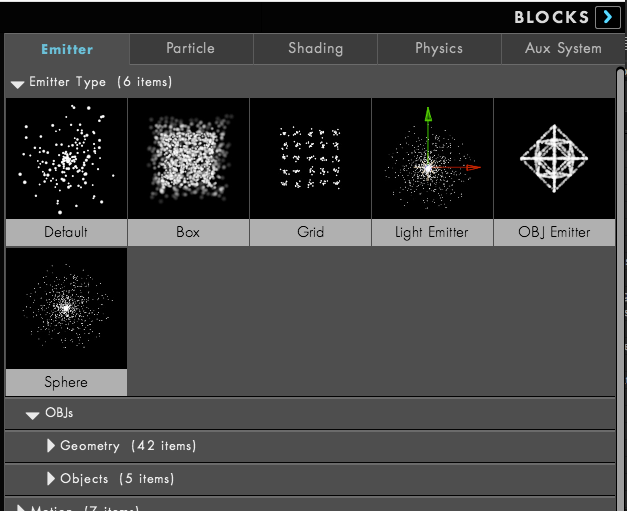 Opening the Emitter Type area in the Blocks pane will reveal 3D OBJ emitter presets, contained in two categories, Geometry and Objects. For more information on using 3D objects as emitters, see the Emitter > OBJ Model Emitter page in the Emitter Group section. For more information on using the OBJ presets that come with Particular, check out the Using Presets page in the Overview of the Interface section. Consult the Saving New Blocks section later on this page to save your own custom Emitter blocks. Refer to the Block Controls section of the user guide for more information on how the specific controls work for the Emitter blocks. 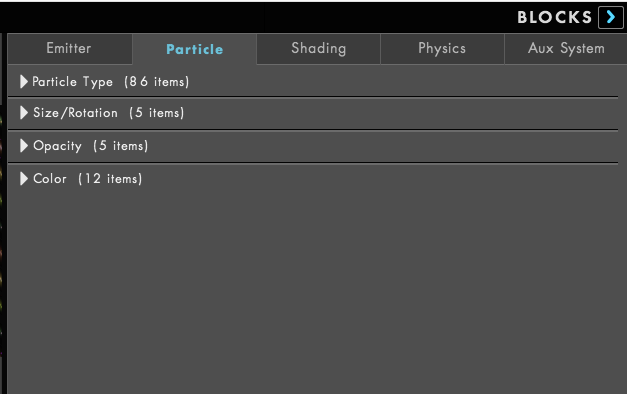 The Particle group allows you to adjust the object that will be emitted as a particle. 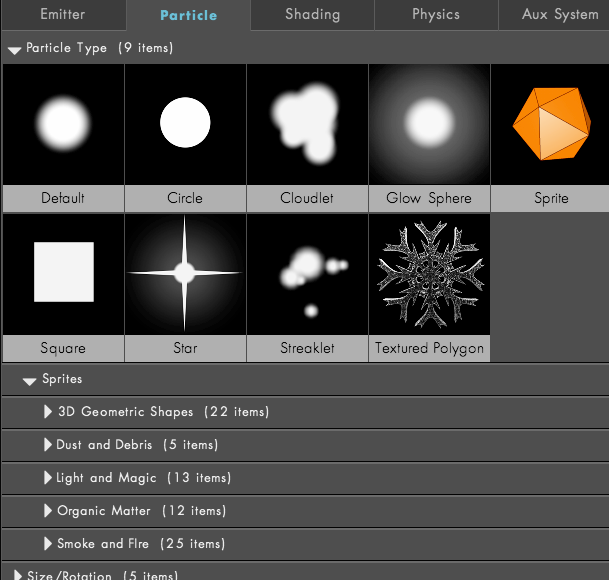 Open the Particle Type area in the Blocks pane to choose a particle type. 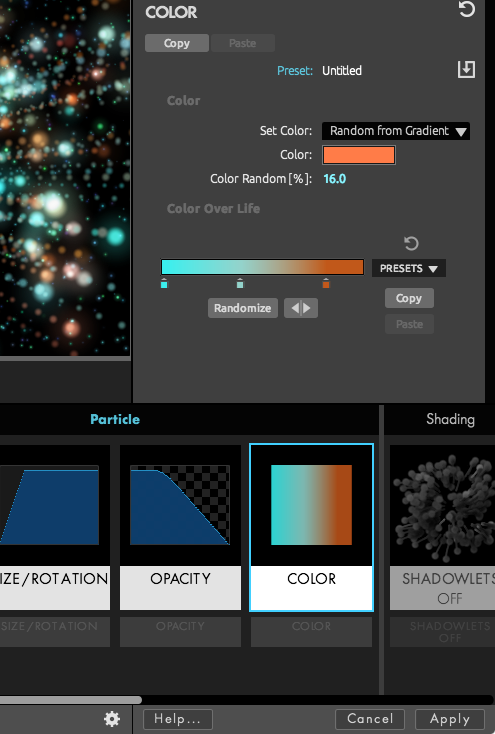 Below the Particle Type section, you can also choose Block presets for Size/Opacity, Rotation, Opacity, and Color. Simply click a Block to apply it to your particles. Note that selecting a Block will overwrite whatever settings were previously there for that Block type. For example, if you selected a Block in the Color section, it would completely replace whatever color you’d previously applied. Immediately below the Particle Type options, you will find some of the sprites that ship with the Designer. As with all Blocks, to choose a sprite simply click on the thumbnail and it will be added to your Effects Chain. 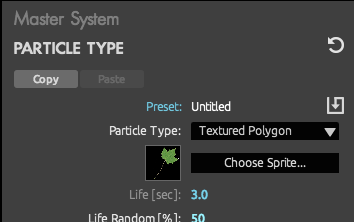 In the Particle Type section in the Block Controls area, if you select one of the Sprite or Texture Polygon options, the Choose Sprite button will become enabled. Clicking that button launches the Sprites browser, which contains hundreds of sprites for you to use. Left to right, the Choose Sprite button, and the Sprites preset browser window. 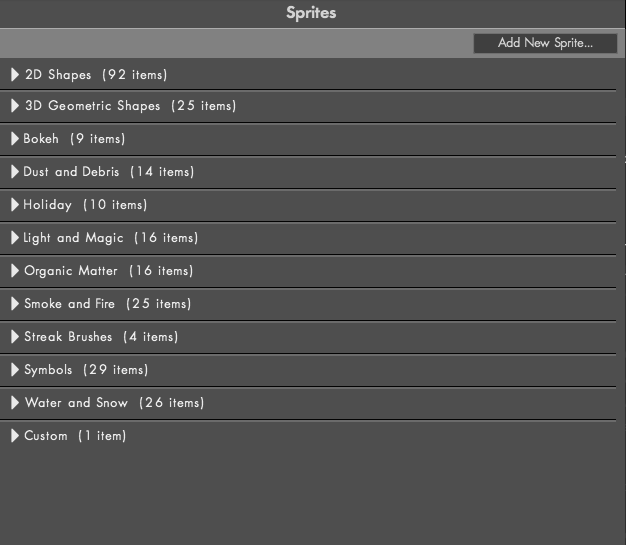 For more information on the sprites available here, check out the Using Presets page in the Particular Overview section. Your imported sprites will appear in a Custom category found beneath the main sprite categories and will be available in all future projects. Consult the Saving New Blocks section later on this page to save your own custom Particle blocks. Refer to the Block Controls section of the user guide for more information on how the specific controls work for the Particle and Sprite blocks. There is only one Shading Block category. Choose one to be represented in the Effects Chain. Consult the Saving New Blocks section later on this page to save your own custom Shading blocks. Refer to the Block Controls section of the user guide for more information on how the specific controls work for the Shading blocks. The Physics Blocks are divided into three different categories. You may have one from each category represented in the Effects Chain. You can choose blocks from the Gravity, Air/Bounce, and Spherical Field sub-categories. These blocks interact along with the Emitter settings to create the overall motion of the effect being created. There is only one Aux Block category. Choose one to be represented in the Effects Chain. Consult the Saving New Blocks section later on this page to save your own custom Aux blocks. Refer to the Block Controls section of the user guide for more information on how the specific controls work for the Aux blocks. The Particular Designer includes many preset Blocks to get you started. Each Block contains its own set of controls that correspond to settings from the main Particular plugin. As an example, the Emitter Block settings correspond to the Emitter group in the main plugin. Refer to the Emitter section of this user guide for more detail on how these controls work. The Block Controls pane is visible when the Blocks pane is closed and a Block from the Effects Chain is selected. The Designer allows you to save your settings for each Block. This creates a new preset Block that you can reuse whenever you use the Designer. With the Color Block selected in the Effects Chain (bottom) and the Blocks pane closed, we see the Block controls on the right side of the Designer interface. To save a custom block, click on the Save Block Values icon located at the upper right hand corner of the Block Controls pane. Once saved, the new block will appear below the preset Blocks in alphabetical order in a newly created section called Custom. To reset the Block settings to their defaults, click on the reset icon located at the top right of the block controls pane (immediately above the Save Block Values icon).